Neptune's Day Is Shorter Than Was Thought : The Two-Way Figuring out how long it takes the gaseous planet to rotate isn't easy. A University of Arizona astronomer who has now studied 500 images says he's got a more precise estimate. His work should help us understand the planet better. 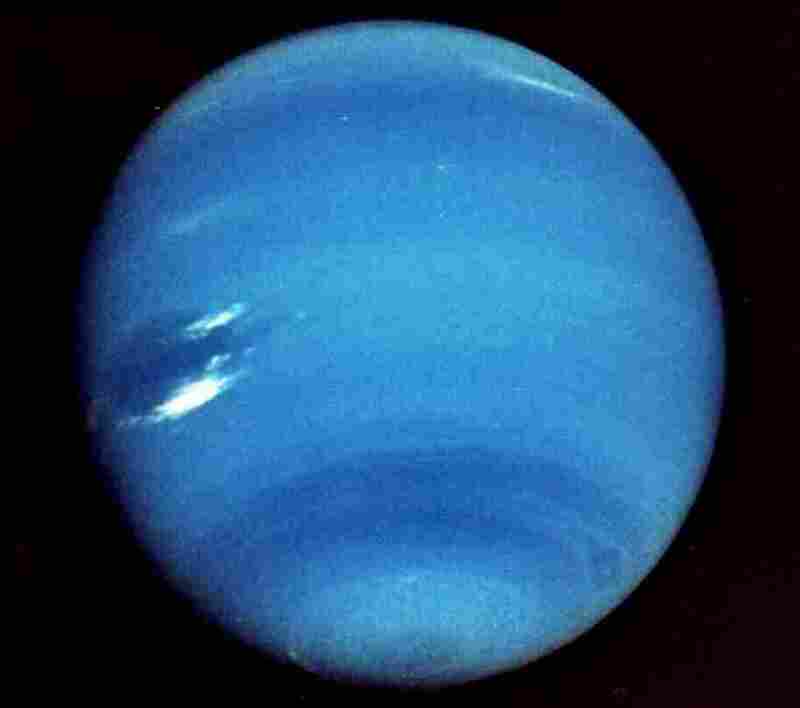 An image of Neptune taken by Voyager 2 in 1989. Neptunians presumably already knew this. A day on the gaseous giant apparently doesn't last 16 hours and six minutes, as we Earthlings have long thought. Instead, according to University of Arizona astronomer Erich Karkoschka, the planet completes a rotation every "15 hours, 57 minutes and 59 seconds." As NPR's Richard Harris tells us, "it's not easy figuring out the length of a day on Neptune, since the entire planet is swathed in clouds. And different clouds rotate at different rates, so they don't necessarily tell you what's happening with the planet hidden down below." Karkoschka, though, "took advantage of what one might call the scraps of space science: publicly available images of Neptune from the Hubble Space Telescope archive," his university writes. "Other scientists before him had observed Neptune and analyzed images, but nobody had sleuthed through 500 of them" that had been taken over 20 years. He noticed that "two features in Neptune's atmosphere" — the "South Polar Feature and the South Polar Wave" — "appear exactly every 15.9663 hours, with less than a few seconds of variation." Digging further, Karkoschka used images taken by Voyager 2 in 1989 to identify six other features on the planet that rotate with the same regularity. The university writes that "in addition to getting a better grip on Neptune's rotational period, the study could lead to a better understanding of the giant gas planets in general." "We know Neptune's total mass but we don't know how it is distributed," Karkoschka says in the university's report. "If the planet rotates faster than we thought, it means the mass has to be closer to the center than we thought. These results might change the models of the planets' interior and could have many other implications." For an animated look at Neptune's rotation, check out this video that Karkoschka produced.